Darey's Not The Girl is wonderful music + impeccable video. I just love to sing/watch this. "You're not the girl I used to know, you're a shadow of yourself // I think I lost you long ago..."
Feeling rather unwell this evening, with a mild fever accompanying indigestion. Been sipping water as doctor said (it helps you burp/fart aka pass gas) but this may not be working quickly enough to keep my health within jolly bounds. 2. Don't lie down after eating. Sleep sitting up or supported with a pillow. 3. No-nos in diet: high-fructose corn syrup, carbonated drinks, cheese and dairy, coffee (take tea instead), fries/chips and fast foods, gluten (as in wheat bread). 4. Add to diet: Garlic, natural fiber foods, and coconut oil. 5. Instead of 1-3 large meals, eat smaller meals throughout the day. 6. You may need additional herbal and natural treatments, and of course pharmaceutical drugs as well. Talk to a doctor. Note: The antibiotics in my treatment regime probably killed off the good bacteria in my gut as well as the bad ones. Although the treatment is over, it appears that I need more time to regain the ability to digest complex foods.I ate several new things today: cheese, malt (the worst), moin-moin (made with beans) and had no fruits/veggies to speak of. Other note: My current suffering also gives me a great appreciation of what infants go through with their little tiny stomachs processing all that milk. It appears that the need to burp can make you very unhappy and even give you a fever. Isn't this weird: Vitamin C and iron tablets can irritate the esophagus (read more) and excessive iron causes constipation. Can't wait to be done with the medicines. Are there natural remedies for chronically unhappy stomachs? Please comment if you have any suggestions. Right now my tummy is at ease (sitting up to type must have helped) but the temperature is up. You are making fun of me! When your head is down. I found crazy money there. I combed my ebony hair. Brought the ladies to represent. Ha, we built a stage set. It looked like bricks and cement. And I am the thief. And the pole is through my heart. 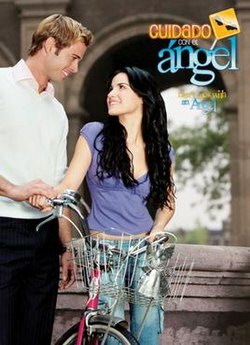 Watching Cuidado Con El Ángel (Be Careful with The Angel). I've been very ill (was very ill), recuperating, and asked my friends to bring me telenovellas to watch. Now I have a pile of them. The cheesiness is killing me. It's great therapy. THANK YOU. and the one that started it all, El cuerpo del Deseo (The Body of Desire) also known as Second Chance. I'm reading a bit too: Open City (nice; Teju Cole), and Sons and Lovers (again; D.H. Lawrence). Reading slowly. Pretty weak.